This story was originally published on JadaWest.com. I never finished college and yet I still found my passion and I am pursuing it Daily! 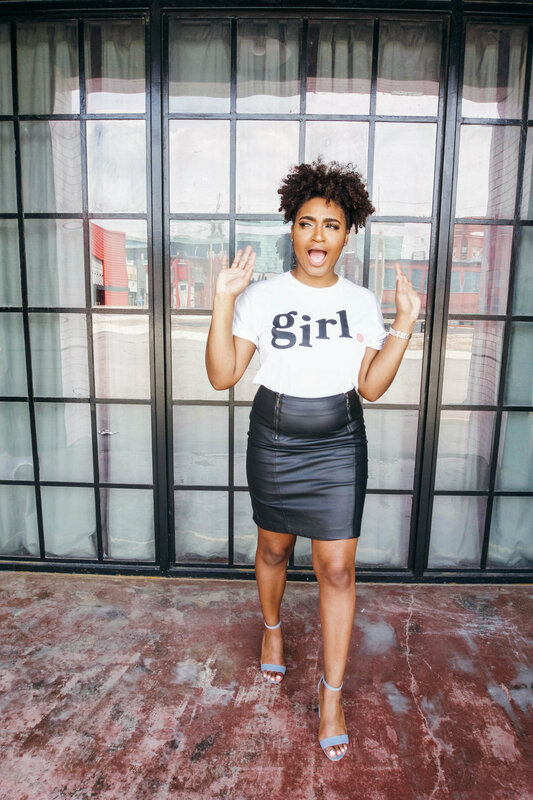 "My Girl Story" prompted me finally sharing my journey to becoming a Repurposed Fashion Designer, and MAN, it is really an interesting one. No where in the life I planned for myself did I imagine I would be a single mother and working to become a Repurposed Fashion Designer. I dreamed of graduating with my degree in Fashion Design, then get hired by a big design company, and finally build my own major label ( reminiscent of Betsey Johnson, Chanel, Yves Saint Laurent). Lo and Behold, the Lord had greater plans for me and the place I am in right now is so much more fulfilling than anything I orchestrated for myself. This story was originally posted on MyOrganicEncounters.com. Hmmm, where do I begin? What’s #MyGirlStory? What details made me who I am today? What did or didn’t happen that shifted my view and brought me to where I currently am? I’ve sat and thought about that question quite a bit over the last two weeks. Truthfully, I could’ve made a simple small post when I posted the picture rocking this super cute outfit but I wanted it to be real and raw and sometimes real and raw isn’t short, so here it is. If I’m being honest a lot happened, more than I care to divulge today but I will share three key things that brings me to #MyGirlStory. I was raised by two strong women, one being my mother and the other being her mother. They didn’t always know what they were doing or if it was the right way, but any great quality you find in me directly stems from those two. From my giving ways, to my need to always be doing something, down to me being a chatty cathy regardless if it’s with a stranger. I grew up in the suburbs, the hood, and the “in-between” so my view of life, people, and my surroundings has allowed me a chameleon. I can go into any room, in any crowd, with any people and talk to them like we’ve been best friends all our lives. I love to talk and people love talking to me. It took me twenty-five years to figure out who I truly am and I’m damn proud of what I’ve learned. I’m resilient. I’m strong. I’m loud and bold. I’m courageous. I’m a room captivator. I’m a lover and nurturer. I’m a spoiled baby who can be sweet as pie or as fiery as the flames coming out of a forest fire. My story is still being written but what I’ve learned is to seize every moment of every day; take in the things around you. Smell the fresh air and enjoy the time with your loved ones while they are in front of you. Don’t wait on your dreams and never go with the practical route because at the end of the day your happiness is what really matters. Go outside, be social, talk to strangers, and never get so used to the way things are that you aren’t willing to accept new perspectives or new ideas. Love and when you love, love hard and unapologetic-ally, I mean if you don’t put yourself out there you will block the chance of seeing what genuine love feels like and what someone else has to give. Lastly, be happy! You can be sad, depressed, moody, or angry but honestly it’s just wasted energy. Do whatever it takes for you to be happy because life is not promised pass the second you are currently in. To participate in #MyGirlStory follow the hashtag via Instagram and checkout my good friend Jasmine Diane’s #GirlLine featured at JasmineDiane.com. #MyGirlStory had me on the search for this super cute tee all year and I’m so glad I found it and got the chance to share my story with you all. *Fun Fact GIRL is literally my favorite word. If you are a woman I will call you girl, LOL. I even call my Mom and Ganma, GIRL. because it’s just my thing – always has, always will be. Y’all can only imagine how special I felt when I won this t-shirt in one of Jas’ giveaways she did earlier this year, it was like she read my mind and sent me my favorite thing. Be sure to follow her and check out her merchandise and when you cop your GIRL tee, share your #MyGirlStory too. My entire life has been a musical stage play! Exposition: Born in Kansas City, MO in May during a great year. Rising Action: Growing up, my mom kept me busy and had me in everything. Ballet, tap, jazz, gymnastics, cheerleading, singing and acting. I even think I had a piano lesson once or twice. But I was always drawn to the arts. I performed in musical theater, danced competitively, was a Kansas City Chiefs Cheerleader, auditioned for Beyonce and moved to the South to share my passion for the Arts. Climax: I was exposed to a whole new world when I moved to Atlanta in 2007. Deciding to leave my family was difficult as we are extremely close and always have a good time when we’re together. Moving 817 miles away and not knowing anyone was a Horror Movie! But when I tell you, God know’s exactly what He is doing.. when He speaks to you, obey and keep it moving honey. The other side of that yes is such a gift! I continued to dance and work in the entertainment industry when I was reconnected with my Philanthropic Sister Shiv’on, who had recently moved to Atlanta and called me with a brilliant idea to create a Non Profit for young girls in need and asked if would I be down to collab. Of course I agreed! A seed was planting and in 2009 we began rebuilding confidence from the sole with our Non-Profit, Show Me Shoes. Show Me Shoes is almost at our 10 year mark saving soles. In December 2018, I’ll be celebrating 1-year “on my own” Long story short, I fasted for 2 months, heard Our Creator tell me MOVE in the forms of dreams, other people, app notifications (yes He speaks through those too) and during prayer time. I listened, was obedient, cried in fear, but did it anyway. On December 1st, I turned in my resignation notice to Cox Media Group with no clue of what my journey would hold other than Show Me Shoes. I’m 80% Pescatarian trying to go Vegetarian. My diet doesn’t become an issue until I visit KC and eat BBQ and Go Chicken Go) There’s always room for growth and evolution though, right?! The journey of self-discovery, post working in entertainment most of my adult life, has been life changing and revealed a whole layer of Anneka Maquay that I didn’t even know existed. Hey girl hey! As others read my #girlstory, I want them to understand that the sooner we can begin to unveil who we are, the sooner we can show up and step into our purpose. And do so, unapologetically. #MyGirlStory is a campaign promoting girl power through positive stories. I want to know what advice you would share with your younger self and how that advice impacts you today. It is my hope and prayer that together, we as millennial women can encourage each other and younger generations with our words. Everyone’s story won’t draw massive tears, but some will. Self-reflection is vital to growth. With #MyGirlStory, we as women will be able to celebrate our gains and triumphs while being transparent about the journey. Keep scrolling to be inspired by other women who have overcome insecurities and launched into greatness. Whether it be to not sweat the small stuff or to focus on your goals no matter what – there are always things we wish we knew then that we know now. One of the main reason I wanted to join Jasmine on her campaign is because even though I can’t go back in time and tell the younger me these things, I can share what I’ve learned for someone who might need to hear it. Read more here. I've always been outgoing and opinionated, but man did my dyslexia hold me back. I can remember an assignment in middle school where we had to read a Time article and take notes about the article for homework. Sounds easy right? Well, my "notes" where 13 pages, and the article was only 7. Talk about embarrassing. I just didn't know why I would read things and immediately forget what I had read. Until I met with a tutor and they discovered my eye movement was way off when I would read. It was crazy y'all! I've always been the type of person that if you do something to me, or speak something I don't agree with I will just shut down completely, or never talk to you again. This passive way of dealing with problems led to years of hurt and frustration. I've lost relationships with friends and family because I chose not to discuss the problem and instead enforce the "silent treatment." Joining is simple. Purchase a Girl tee here and tell your story. Join me in freedom by sharing your #MyGirlStory in the form of a blog post, video or social media post. Once your post is live please leave the live link below. Hey sis! 2019 is almost here. This post is transparent in nature with a lot of real talk and encouragement loaded in. Before you dive into #MyGirlStory, I want to tell you thank you for visiting my site. I am super excited to finally share #MyGirlStory with you. It’s been a long time coming. I wanted to create something bigger than Jasmine Diane with the same purpose which is to empower millennial women to chase their wildest dreams. I do this through career and style advice, but this is a step further… more intimate and more social. Actually, silly, this is how & why #MyGirlStory matters. #MyGirlStory is a campaign promoting girl power through positive stories. I want to know what advice you would share with your younger self and how that advice impacts you today. It is my hope and prayer that together, we as millennial women can encourage each other and younger generations with our words. Everyone’s story won’t draw massive tears, but some will. Self-reflection is vital to growth. With #MyGirlStory, we as women will be able to celebrate our gains and triumphs while being transparent about the journey. I was raised with 4 sisters and 1 brother in Kansas City. I was always the loud one, the overachiever, smart and sassy with an eye-roll that could slice a tree in half. I’ve known anything but excelling, from straight A’s to dating jocks to getting scholarships and awards. But there was something missing until recently. As a little girl, I always felt the need to prove my worth through overachieving. For me accolades from others meant more than enjoying the work itself. I would come home from cheer practice, do my homework, iron my clothes, take care of chores and do whatever else was required of me before the night ended. Sounds good, right? Yes, and looking back on things I wouldn’t change my actions. The thing that I wish I knew as a little girl is, “It’s okay to make mistakes.” I would literally cry my eyes out over B’s and get overly sad about “feeling fat.” I was chasing perfection until I realized recently that God’s grace extends to me too and it’s okay to be gentle with myself. Life got a whole lot easier when I started to give up control and stopped chasing perfection. That doesn’t mean that I’ve lost ambition because I haven’t, but I now know that life is a journey not a sprint. I wish someone told me that I was going to fall, but then I’d rise stronger and more self-aware afterwards. I sometimes wonder what it’s like to live carefree. There is a sweet spot where carefree and overachieving meet. That sweet spot is where I want to be. That sweet spot of wanting big things and being okay with the journey is what I want every girl. It is imperative to give yourself grace and time to learn. It wasn’t until after graduating college that I realized who I am and the power that I possess. I say all of this to say, give yourself time to grow. Give your heart time to heal. Give your mind time to think. You won’t solve all your problems on your own and you won’t conquer Rome in one day, but you can grow closer to your dreams with each step. You should share your #MyGirlStory because it will liberate you. Honestly, I want this campaign to inspires millions of millennial women. But the key to igniting fires in others is liberating yourself. I cannot build you up without legs to stand on. Similarly, an empty mason jar cannot water a garden. Sharing your truth will help you to heal and inspire other girls alike. Women don’t get enough credit for being powerful and courageous, so let’s challenge that by sharing our strength. I never imagined that I would still be blogging almost 5 years later but here I am, still sharing. The high that I get from sharing content then receiving comments and texts about how it’s helped someone’s life is incomparable. Any female can participate in #MyGirlStory. If you have a story to tell, please share. I am super interested in reading posts from bloggers and watching videos from YouTubers. There are a few already working on their #MyGirlStory content that I am eager to share. If you’re not a content producer, please join us by creating a social media post. Together we can get #MyGirlStory to the masses to inspire millions. Join me in freedom by sharing your #MyGirlStory in the form of a blog, video or social media post. Once your post is live please leave the link below. I will begin to share out #MyGirlStory posts as they roll in. Don’t forget to purchase your Girl. Shirt for your post. I can’t wait to see your style and read your story. What is your #MyGirlStory? Please share the link to your content below or simply leave a comment. I’m dying to hear from you. What does chasing your dreams look like for you? Thank you for reading and staying until the very end! Please do me a favor and share this post with your girls. In the meantime, follow us on Instagram and Facebook!